Today, at Tech World Transform and ISC High Performance ( ISC2017), Lenovo (HKSE: 992) (ADR: LNVGY) unveiled an end-to-end data center portfolio that enables customers to harness the power of the "intelligence revolution" and create a strong technology foundation that supports transformative capabilities such as data analytics, high-performance computing, hybrid cloud, artificial intelligence and machine learning. Building on Lenovo's number one position in customer satisfaction 1 and server reliability for x86 servers 2, Lenovo introduced its largest, most comprehensive portfolio of server, storage, networking, software and data center services, as well as a new set of brands poised to take this leading position in customer satisfaction to even greater heights: ThinkSystem and ThinkAgile. "Today's announcements mark a significant day in the next phase of Lenovo's commitment to advancing the data center customer experience," said Kirk Skaugen, President of Lenovo Data Center Group. "Our leadership in x86 server customer satisfaction and x86 server reliability, along with these new ThinkSystem and ThinkAgile brands, and Lenovo's new portfolio of data center solutions represent the most reliable, most agile, and highest performing data center solutions in the industry. We are confident we can empower our customers to solve their most challenging business problems and become digital disrupters in their own industries." This year, Lenovo celebrates 25 years of proven Think quality, performance and reliability, and Lenovo ThinkSystem and ThinkAgile data center solutions provide organizations with fluid resources that can adapt to the evolving needs of a business. According to a recent IDC survey of CIOs and technology leaders, 72 percent of respondents cited supporting digital transformation and business growth as the leading rationale in IT infrastructure decisions. 3 In the past three years, hybrid cloud significantly matured, while software defined architectures and hyperconverged infrastructure have disrupted the status quo for IT infrastructure in larger businesses. To respond to these changes, customers face challenges including evolving their infrastructure strategies and considering how to best enable them now and for the future. Simplicity: Often, customers find the price for technological advancement and advanced IT capabilities is complexity and confusion. The new ThinkSystem portfolio of servers, storage and networking solutions allows customers to address these concerns by giving them the ability to streamline IT infrastructure; this leads to increased service levels of data center operations that tie directly to business growth. At the same time, we believe customers shouldn't have to choose between certain technologies for fear of vendor lock-in or the inability to scale technology as workloads change. We engineered the ThinkSystem portfolio to work seamlessly with an organization's previous investments, without the need to completely re-architect the data center. Customers can start fresh, without starting over. 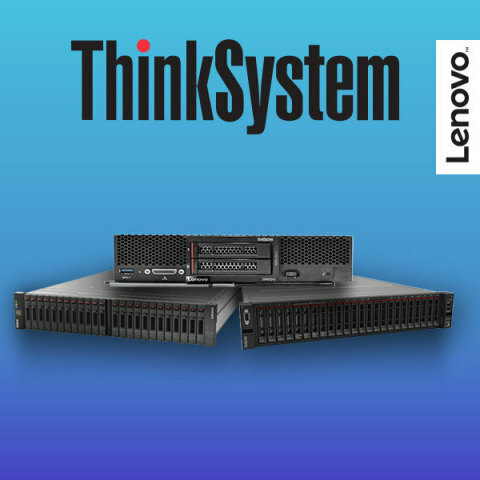 ThinkSystem combines the best of the Systemx from IBM heritage with the Lenovo ThinkServer franchise into a single solution built on a history of more than 150 worldwide record x86 server benchmarks: number one in customer satisfaction and number one in reliability. Agility and Flexibility: In today's competitive environment, customers must quickly use data-driven, actionable insights to refine applications and the customer experience will be paramount to today's businesses as they strive to uncover new competitive advantages in an increasingly crowded market. With the Lenovo ThinkAgile portfolio, integrated solutions adapt to these changing IT and business needs by delivering the speed, simplified management and agility of cloud services while retaining the much-valued control and governance of on-premises IT. Its pre-integrated, pre-built and pre-tested offerings deliver robust new capabilities to customers' data center, including automated lifecycle management, decreased TCO and reduced need for IT resources to maintain the platform. These solutions include the ThinkAgile SX series for Microsoft Azure Stack, as well as the ThinkAgile SX rack level solutions that integrate networking with hyperconverged offerings for a seamless customer experience. And because Lenovo is not encumbered by legacy network and storage solutions, customers have the confidence that they can move full-speed ahead on software-defined, while seamlessly integrating with their legacy investments. Future-Proofed Preparation: With the pace of technology innovation continuing to accelerate, customers will increasingly require the flexibility to adjust to changes and ensure the infrastructure they implement today stays relevant for their future needs. We designed the ThinkSystem and ThinkAgile solutions, such as the ThinkSystem SD530 high-performance computing offering to support workloads spanning large data analytics applications to high performance computing, artificial intelligence and the largest hyperscale environments. Lenovo is committed to delivering transformational experiences for both its customers and the industry and is pleased to announce the delivery of one of the most powerful systems - among the first in the world based on Intel Xeon Platinum processor family - to Barcelona Supercomputing Center (BSC). The BSC MareNostrum 4 supercomputer, tasked with jobs in science and engineering research, incorporates 48 racks with more than 3,400 nodes with next generation Intel Xeon processors and a central memory of 390 Terabytes. Its peak power will be over 11 Petaflop/s, allowing the center to test and analyze the performance of the most recent developments in the field of supercomputing. "The newly launched x86 ThinkSystem platform provides us with ten times more processing power than the previous MareNostrum supercomputer, allowing BSC to continue the type of scientific research that enhances humanity's efforts to seek new knowledge and drive progress. Our experience with Lenovo has been easy and tightly integrated to overcome our challenges and achieve success, and we look forward to future collaboration," said Sergi Girona, Operations Director, BSC. "We have a rich history of collaboration and transformative innovation with Lenovo," said Lisa Spelman, Vice President and General Manager of Intel Xeon Products at Intel. "The introduction of Lenovo's new ThinkSystem and ThinkAgile portfolios, designed for Intel's Xeon Scalable processors, is a natural extension of our longstanding commitment to providing customers with reliable, industry-leading data center solutions that will support customers as they look to capitalize on next-generation workloads like artificial intelligence and deliver world class service capability on-premises and in the cloud." More information about Lenovo's ongoing work with Barcelona Supercomputing Center (BSC) is available here. Lenovo (HKSE: 992) (ADR: LNVGY) is a $43 billion global Fortune 500 company and a leader in providing innovative consumer, commercial, and enterprise technology. Our portfolio of high-quality, secure products and services covers PCs (including the legendary Think and multimode Yoga brands), workstations, servers, storage, smart TVs and a family of mobile products like smartphones (including the Motorola brand), tablets and apps. Join us on LinkedIn, follow us on Facebook or Twitter ( @Lenovo) or visit us at www.lenovo.com.